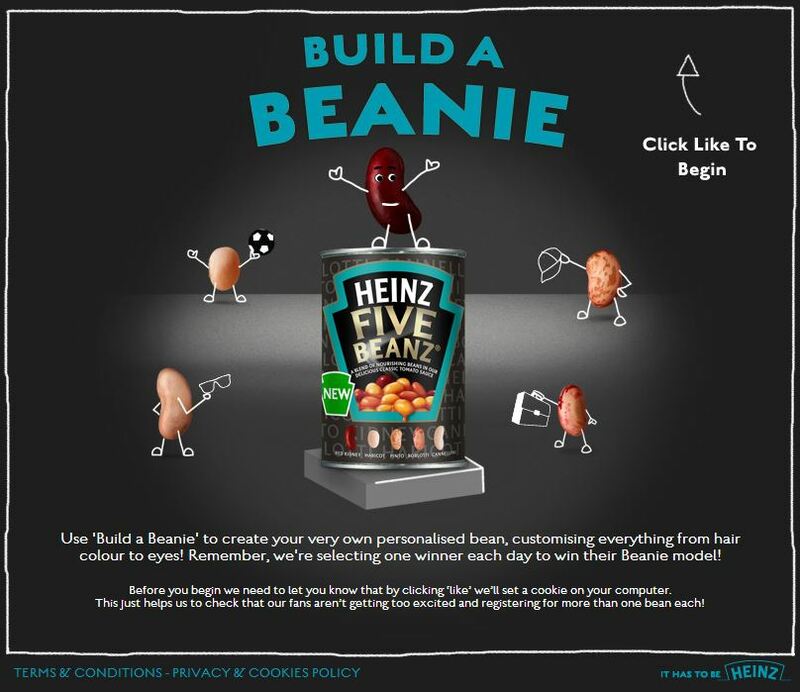 Heinz is running a Facebook app throughout June to allow consumers/’fans’ to design and win their very own look-a-like bean! To take part, fans need to complete a personality test to determine the type of bean they are before being entered into a prize draw. Heinz will then select a winner each day over the next month. It is part of a campaign for the brand’s healthier Five Beanz range, which includes print, digital and in-store promotions. The campaign, developed in partnership with We Are Social, is an update to last summer’s activity – “Your Name On A Bean”. Heinz says the effort attracted 30,000 Facebook fans and was shared by more than 10,000 users over two weeks. The Facebook strategy is being extended to the food maker’s HP Sauce brand. The company is offering Facebook fans the chance to win one of 100 personalised HP Sauce Bottles to celebrate Father’s Day. Fans can enter their details on Facebook to be in chance of winning with those that share the competition with their friends being more likely to be selected. Heinz has been experimenting with allowing fans to personalise it’s products since 2011, but up until now has never run more than one campaign in a year. It says personalisation is an “innovative” way to reward loyal fans. Katie Bleach, marketing controller for Heinz, says “personalised items” provide “‘money can’t buy’ brand experiences to fans and are key to generating online buzz across its brands. Elsewhere, Heinz has launched a £2million marketing campaign for its Salad Cream brand. It centres around a Facebook “Zing Master” competition where fans compete to win prizes over the next four weeks. The campaign will be expanded into July by allowing fans to create their own lunchbox design from Facebook. Heinz is using the push to introduce a new label design across its entire Heinz Salad Cream range. It is being backed by experiential and in-store activity.